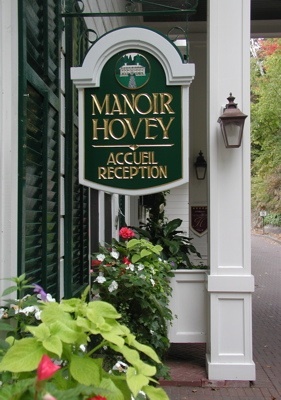 Manoir Hovey in North Hatley, Quebec. Photo by Sue Frause. The city of Montreal isn't alone when it comes to having lovely inns and hotels. The entire La Belle Province has a flair for innkeeping. Here are some of the wonderful places in Quebec where I've stayed over the past five years. Fairmont Le Manoir Richelieu, La Malbaie - Located 90 minutes northeast of Quebec City in the Charlevoix region, this 1929 “castle” is in fact a resort complete with a golf course and casino. I’m not big on gambling, so I look the other way, out to the glorious Saint Lawrence River. Beautiful dining and public rooms along with a pool, spa and tennis courts. 405 rooms, 418.665.3703. Manoir Hovey, North Hatley - This charming inn is located on Lake Massawippi in the Eastern Townships of Quebec (near the Vermont border). It was fashioned after George Washington’s Mount Vernon estate, and everything about it is warm and cozy. The inn’s restaurant is one of the finest in the region. 39 rooms, 800.661.2421. Auberge Saint-Antoine, Quebec City - This boutique hotel is located in Quebec City’s Old-Port and near the bustling streets of Le Petit Champlain. Since I’ve stayed there, they have added the restaurant Panache. Their amenities are among my favorites, a product line called We Live Like This. They must be popular, as they’re available through the hotel’s website. 94 rooms, 418.692.2211. Fairmont Le Chateau Frontenac, Quebec City - This is the ultimate in romance. On one occasion while staying there during the Quebec Winter Carnival, a couple arrived in their wedding attire to have dinner for two in the hotel’s Le Champlain. Located on the city’s highest point, it overlooks the Saint Lawrence River, complete with ice floes in the winter and toboganing outside the door. 618 rooms, 418.692.3861. Hotel Le Germain-Dominion, Quebec City - Located in the Old Port, the city’s first skyscraper is now home to this hip hotel. It’s a modern contrast to the historical Le Chateau Frontenac up on the hill, and within walking distance of shops and art galleries. We trudged along in the snow one evening to celebrate my birthday at Initiale Restaurant, a lovely resto serving contemporary French cuisine. 60 rooms, 418.692.2224.